In order to participate in the Summer of Mars festival on June 5, 2017 at Kennedy Space Center Visitor Complex, NASA unveiled a very unique and awesome concept vehicle. They showcased the Mars Rover Concept to the public at the event. 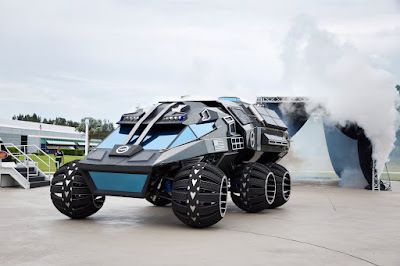 This vehicle is inspired from its predecessor, Lunar Rover. And the Mars Rover is specially designed to pass uneven ground routes on those red planet. This vehicle was made by Parker Brothers Concepts with some input from NASA engineers. As quoted from Carscoops that the concept vehicle has a weight of 6,000 lbs (2,721 kg) and able to accommodate passengers as much as 4 people. In addition, the vehicle is also equipped with a heavy transmission and four 50-inch wheels to conquer the heavy terrains on Mars. The Mars Rover is also equipped with solar panels for fuel substitutes. NASA revealed that the vehicle is designed with two different functions, the first function is used as a cruiser or as a walking laboratory. The vehicle's power of these Martian car is not kidding, because it is powered by a 700-volt batteries, so make it can travel around 70 miles/hour (112 km/hour). But because it will be used on the planet Mars, then this car can only reach speeds of 10/15 miles/hour due to the gravitational factors on those red planet.